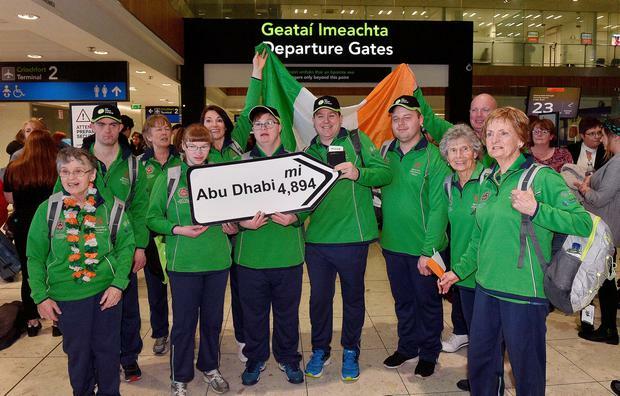 Nerves and excitement filled Dublin Airport as Ireland’s Special Olympics team set off to Abu Dhabi to conquer the world. Some 91 athletes boarded their planes along with their coaching staff and hundreds of family members waving them off. And the advice of some of the countries sporting legends was still wringing in their ears. Niall Quinn was on hand to show the footballers how things were done for one. Daniel Byrne (19) from Lucan was selected for the team at the Ireland Games last year. "I got a letter home saying I was selected to represent Ireland at the Special Olympics in Abu Dhabi. It was music to my ears getting that letter, I was so delighted to get it," he said. "His words of advice were to go over there, do well and just enjoy every minute of it. He gave us good tips and also thought us a thing or two about heading the ball, he was a master at it." His teammate, Stephen O’Leary (29) from Fermoy, Co. Cork said it’s been a long few weeks waiting. "It’s an amazing opportunity, I may never get this opportunity again so I’m just going to try and cherish it and hopefully have a good time over there," he said. "I’ve been in the Special Olympics since 2009 and this is the first time getting picked for the games, so it’s amazing feeling. "It’s 10 years I’ve been involved, so it’s an amazing moment that I hope to cherish and enjoy every bit of it over there. "I hope to come back with the gold and do the Irish, do our friends, do our family and everyone proud, most of all do ourselves proud," he added. Meanwhile, in her 13th year involved with the Special Olympics in Ireland, Siobhán Dunne (27) from Tyrone will represent Ireland at basketball. "So 13 is an unlucky number but not for me," she said. And its not just the mainstream sports the Irish will compete in. Bocce – a sport in the boules family – has Richard Currie (23) also from Tyrone training hard all year for success and says he’s the Usain Bolt of Bocce. "I’m really confident of winning, focused, flat out training three times a week," he said. "He [Bolt] is my role model, I look up to him." The Games - which will be the largest sporting event in the world this year - will include 24 sports, 170 different countries and 7,000 athletes. Some 91 athletes, more than 100 coahces and volunteers and in excess of 500 family members will travel over from Ireland alone, with the Games beginning next Thursday. Ryan Nugent in Abu Dhabi There is a secret to the success of Ireland's Special Olympics athletes and it all lies in focusing the mind - with some of the stars practising tai chi during the interval in their competition.